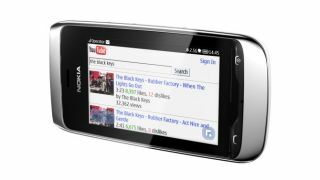 Nokia has unveiled a pair of new affordable touchscreen handsets, in the form of the Nokia Asha 308 and 309. The only difference between the two new phones is that the Asha 308 offers dual-SIM switching while the 309 is a single-SIM phone. Both come with a 3-inch WQVGA capacitive touchscreen and nifty swipe interface, while network-wise they are 2G affairs (which makes sense since Nokia is clearly aiming them at emerging markets). Other features include Wi-Fi connectivity, a 2MP camera, support for up to 32GB microSD cards and 40 free EA games plus native Facebook, Twitter and YouTube clients. Web browsing should also be a breeze thanks to the inclusion of a new version of the Nokia Xpress Browser, which the company claims makes for 90% more efficient mobile browsing. But the headline news is the price – the handsets come in at just US$99 (about £60, AU$95) which makes them Nokia's "most affordable capacitive touchscreen devices". That low price comes at a, er, price: the two handsets run S40 – that's basically about as low as you can go in the smartphone OS arena. Both handsets should make their debut in the final quarter of this year, some time between October and December. In the meantime, check them out in all their chunky, swipe-happy glory in the video below.